Wisdom teeth are always considered a controversial topic in the dental field. Our jaws have become smaller over time, leaving slightly less room for teeth. It is still large enough (in some cases) to accommodate our wisdom teeth. A common misconception is that leaving the wisdom teeth in causes the rest of your teeth to crowd and shift; these two are usually unrelated. Recent studies show that individuals that are born without wisdom teeth or have their wisdom teeth removed as a young adult experience just as much shifting and crowding as those with wisdom teeth. This malalignment is usually caused by the lower jaw, or mandible. The mandible slightly changes shape as we age, causing teeth to move around over time, which may result in crowding. There are a few questions to consider when observing these third molars in order to determine if they should be removed. 1. Can the teeth be easily and sufficiently cleaned? 2. Are all of the wisdom teeth in-line with the other teeth? 3. Are the wisdom teeth fully erupted from the gums? If the answer to any of these questions is no, your dentist may suggest removal of the affected wisdom teeth. First and foremost, the ability to clean the teeth is extremely important, as without sufficient care, these teeth will form cavities, causing discomfort and pain for the patient. Additionally, the impaction of wisdom teeth can develop gum disease. Impacted teeth can be slightly covered by gum, creating pockets that are extremely difficult to clean, leaving them prone to gum infections. Impacted wisdom teeth are common and, if necessary, can be removed with little to no complications, allowing you live a happy, healthy life with a beautiful smile. If you are concerned about your wisdom teeth, feel free to contact us or schedule an appointment. I would be happy to answer any questions or concerns you may have. What is the deal with teeth whitening? 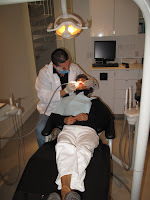 Many people ask and want to know; what is the deal with teeth whitening and which is truly the best way to whiten? With so many options out there these days it is certainly a good question. You have your in office whitening procedures such as Zoom and Brite Smile as well as your over the counter products such as Crest Whitening Strips. I've been asked many times which is better and most effective. With your over the counter products, such as Crest Whitening Strips you will defintely achieve results, however, they can not be customized to your mouth and tooth structure. Many of the strip products will make your gums sensitive and sore because the strips are "one size fits all" and often when placed on your teeth extend onto your gums. In other cases, if someone has a longer tooth structure they may not cover the entire tooth, therefore, not whitening the entire tooth. Last but not least, depending on the size of one's mouth the strips may not be long enough and therefore not go back far enough into the mouth to cover the necessary teeth for a beautiful white smile. The differences with in office procedures, specifically our Zoom in office procedure are many. First and foremost our in office procedure is a two hour whitening appointment during which your teeth can lighten 8-12 shades. However, through time we have perfected our whitening procedure by also providing our patients with customized take home trays to further enhance the whitening process and to produce better and longer lasting results. A mold is taken of your teeth at your whitening appointment to create an exact fitting whitening tray for both your top and bottom arch. With this type of personalized tray the whitening gel is able to spread across the entire surface of your tooth without spreading onto your gums and extends back the entire arch. At Prosmiles we do both the in office Zoom procedure in addition to the customized take home trays and whitening gel, all for ONLY $450! Finally, we wanted to address to myth that once you whiten your teeth you can no longer drink your favorite drinks such as coffee, tea or red wine. That is absolutely false! As long as you do a maintanance whitening at home for one hour with your whitening trays every four months your teeth will stay white; just the way you like them. If you have any other dental or whitening questions you would like answered do not hesitate to call our office and I would be happy to address any question or concern you may have. The Jewish Family Services has held the Night of 100 Dinners every year for the past nine years, staying true to their primary focus and commitment of feeding the hungry. As Ilene S. Gelman, JFS board president, explained for the Bergen News "One of our central missions is to fee our neighbors who are hungry, and one of the primary focuses of this even is to continue doing so." Guests from all over come to support JFS in their mission, meeting up at Englewood Hospital for a Cocktail Event and then given a specific home to have dinner along with other selected guests for that particular home. JFS invited Dr. Lena and Dr. Mircea to show their appreciation for the amazing work that they have done for a few of the very special people they work with. You may have seen a previous post about the fabulous job the doctors did with Susan Berlinrood, a Hackensack resident, who came to us through JFS. We were more then happy and quite honored to be able to be a part of Susan's transformation and are currently working with another JFS referral who prefers to keep her anonymity. Needless to say we are excited to see the results and will try to keep our followers as much a part of this story as we did with Susan's. Dr. Lena and Dr. Mircea are grateful to have been able to share in the Night of 100 Dinners experience and to have had the opportunity to meet so many kind and generous people work so hard to help the less fortunate in our communities. We hope that everyone reading this will be inspired to do their part, no matter how big or small, and do what they can to help feed the hungry. Every year, the Hasbrouck Heights Chamber of Commerce organizes a holiday parade for the Friday after Thanksgiving. It runs down the Boulevard towards the circle in the center of town where a tree lighting ceremony takes place. Prosmiles moved to Hasbrouck Heights July 24th of this year and wanted to introduce ourselves to our neighbors and welcome them to visit us anytime. As a new business in town we had no idea as to how many people actually attended this parae and were pleasantly surprised when the entire Boulevard started flowing with people from young to old. We set up a table outside our office offering free hot chocolate with whipcream and offering some general information about our office. It was wonderful having the opportunity to meet so many people from in town and taking the time to say hello. Both Dr. Mircea and Dr. Lena joined us outside serving hot chocolate and greeting all of our new neightbors. We have an amazing team at Prosmiles and we all had a tremendous time at this event. 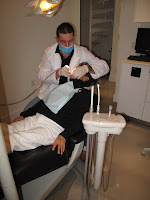 Prosmiles felt more then welcomed and looks forward to many more joyous events in the town of Hasbrouck Heights,NJ. The Story of Susan's Transformation! One of our goals at Prosmiles is to be able to donate our services to someone in the local area, who needs work done but can not otherwise afford it. The doctor's compassion motivated them to provide these services without waiting to build... a substantial practice and despite being one doctor short, with Dr. Lena on bedrest for over three months. Our first such patient was referred to us by Jewish Family Services of Northern NJ. The patient has long suffered from several serious medical ailments whose treatment included some that caused the rotting of her teeth. Unable to chew, ashamed to smile and in constant pain, Susan was overjoyed when she learned of the “blessing she was about to receive”, Prosmiles and its doctors. "This will change my life, I would have never dreamed that this could happen to me and I am indebted to the entire team at Prosmiles." It was hard to see who was happier, Susan or the doctors. We provided Susan with partial upper and lower Valplasts, giving Susan back all of her posterior teeth allowing her to enjoy eating again and have a fully functioning set of teeth. In addition the doctor did some cosmetic bonding to her Anterior teeth (her front teeth) giving her a cosmetically pleasing appearance along with the partials, allowing her to smile again without being self conscious. At Prosmiles we maintain the highest standards and use only the best products on the market. The lab with which we often work, Precision Ceramics in Montclair, CA was so touched by Susan’s story that they decided to provide the partials gratis. Susan volunteers for Gilda’s club and is a cancer survivor. Despite her pain and suffering she always wanted to give back. What goes around comes around, A perfect match by Jewish Family Services of Northern NJ. A question I often get asked is what one can do about their bad breath. One of the main reasons people get bad breath in the first place is because they neglect cleaning their tongue. The tongue is covered with finger like projections called Papillae. It is in between the Papillae that microscopic food particles get stuck. Bacteria then starts to grow because the food particles are stuck in an enviornment of 98.6 degrees which in turn creates a mal odor. In addition to your regular bi-yearly professional cleanings, you should also be cleaning your tongue on a daily basis. In order to do so properly you should purchase a tongue scraper (Breath RX is recommended) which you can pick up at a local pharmacy. Last but not least, due to the fact that most bacteria is found on the posterior part of the tongue, which is towards the back of the mouth, it is important to gargle with mouthwash that contains an active ingredient for treating bad breath. Make sure to gargle the mouthwash and to not just swish it around in your mouth. At Prosmiles we address the issues you are most concerned about. Please feel free to contact our office anytime by phone (201-945-1600)or e-mail (info@prosmiles.net) and always feel free to come visit our beautiful brand new office! Get your teeth pearly white for the summer! Our whitening program is unlike any other out there. Start with our one hour in office whitening, ZOOM, and then complete the process with our customized take home whitening trays to ensure you maintain the whitest teeth possible on a long term basis. All of this for ONLY $450!!!! BLOG SPECIAL!!!! $29 Cleaning/x-rays/exam!!!!! Limited time only! You must mention our Prosmiles Blog!